As noted above, it is currently proposed by the Andalucían Regional Government to translocate up to three lynx from Andújar-Cardeña into the Doñana lynx population in November or December 2007. 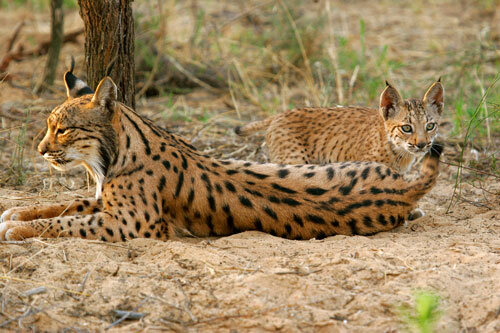 A breeding pair of lynx might be translocated into an area previously inhabited by lynx lost to FeLV and a female lynx might be translocated into an area of Doñana inhabited by several male lynx but no females. Studies have suggested that translocating just a few lynx could significantly raise the genetic variability in Doñana, provided that translocated lynx successfully inter-breed with local lynx. Similarly, it has been argued that removing up to three lynx from Andújar-Cardeña will not adversely affect this population. However, despite support from some individuals and groups, the translocation proposal is controversial. WWF Spain and Ecologistas en Acción, in particular, have voiced opposition to the proposal on the grounds that threats to wild lynx in Doñana – particularly from road traffic – need to be more reduced before lynx should be translocated there from Andújar-Doñana, so as to avoid the risk of any translocated lynx being killed and also to address the root causes of lynx decline in Doñana. The Andalucían Regional Government has implemented a lot of work in recent years aimed at reducing threats from road traffic, including more fences, underpasses, signals and rumble strips, and no lynx are known to have been killed this year in and around Doñana. However, road traffic continues to travel at speeds considerably in excess of 60km/h and 90km/h limits, particularly between Mazagón and Matalascañas, between Matalascañas and El Rocio, and between El Rocio and Villamanrique. Similarly, it may just be luck and/or the numbers of lynx being significantly reduced by FeLV in 2007 that has led to no lynx being killed by vehicles this year.